Discussion in 'iPhone Themes' started by k00laid, Sep 4, 2011. Wow, very nice... will you share that wallpaper and what lock screen is that one? yeah sure... here is the wallpaper for the lock screen. The lockscreen is called "Wordclock Widget" its free in the cydia market and comes with the homescreen i have as well as the lockscreen. 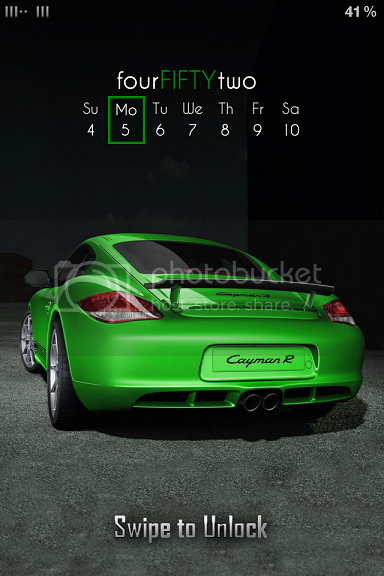 The green porsche is the default wallpaper it comes with. I havent changed it because i havent had time to look for another one. guess thats how things work when your cranking almost 60 hours a week and trying to move to a new city at the same time. EDIT: the bubbled folders and icons are from a paid theme called Unique HD and then the status bar is from another paid theme called VIP HD. I basically took the items i liked from each theme built them into a single theme and this is what came of it. Here are my themes. Simple but fun and I love the apple logo! JackieTran makes a good theme! Ya he does! I've had a lot of great themes in the past, but I always make my way back to Black UPS! Lol that was the very first theme I downloaded! I swap between it and Anbu HD! Here are my screens, I use UiNique theme and Bigify with nothing special. Here is my old theme. HTC sense. I like it! I might swap back to it soon!